Indo-US Science & Technology Forum (IUSSTF) is a forum which makes valuable contributions for strengthening the bilateral US-India relationship by exploring and identifying fruitful areas of cooperation through sponsoring workshops, scientist exchanges and meetings. 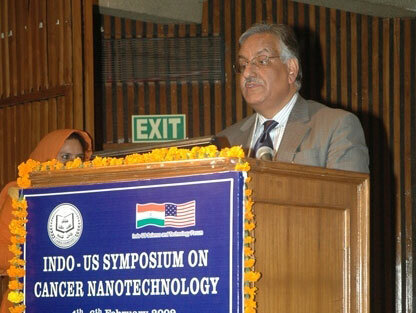 The three days Indo–US symposium on Cancer Nanotechnology (4-6th Feb 2009) was held under the aegis of IUSSTF and hosted by Jamia Hamdard at INSA Auditorium, New Delhi. The purpose of this summit was to bring scientists, technologists and industrialists from both the partners to one platform in order to have intensive discussions about the cancer related problems in their respective countries and to explore the possibilities of collaborative research for fighting out the problems related to cancer management. The former president and visionary Dr. APJ Abdul Kalam graced the inaugural function of the symposium and congratulated the organizers for bringing together eminent scientists from different laboratories in USA & India working for the common cause of fighting the burgeoning problem of cancer. He strongly felt that the partnership of inventive genius of engineering and compassion and competence of cancer doctors and researchers can provide the healing touch to the indomitable spirit of cancer fighters. He greatly emphasized on the fact that the drugs should be prepared and designed in the manner that they have high affordability and acceptability amongst the masses. He concluded his lecture by providing leads to current researchers and suggested certain breakthrough strategies like targeted drug delivery systems, gene silencing, etc. He envisioned that an appropriate academia, industries and doctor’s collaboration would result in finding a solution for cancer by using Nanotechnology. He extended his best wishes to the scientists and all participants for fruitful deliberations for finding a cost effective modality for tackling the existing problem. Dr. S. Ahmad while introducing the chief guest related to certain anecdotes pertaining to the development of various nanotechnological products and dwelled into the various facets of development of nanomedicines. While casting his presidential remarks Dr. G.N. Qazi, Vice Chancellor of the host institution (Jamia Hamdard) emphasized upon the biological perspective which should be addressed while formulating any novel nanotechnology based formulation. He also highlighted the ongoing research work at Jamia Hamdard. He particularly stressed upon the need to follow the regulatory guidelines in order to manufacture the nanoproducts as per cGMP. On this occasion Prof. A. Maitra and Prof. R.K. Khar welcomed the guests and vote of thanks for the inaugural function was given by Dr. Farhan Jalees Ahmad. 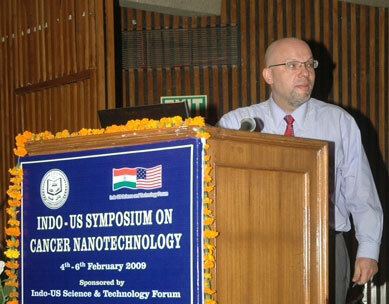 Prof. Piotre Grondginski and Dr. Scott McNeil from National Cancer Institute, USA delivered their lectures on the various facets of Nanotechnology. The day one of the symposia ended with the cultural programme performed by Amar –Sabhyasachi group which entertained the audience by Handshadowgraphy.